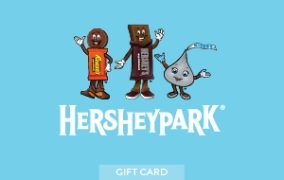 Make them Hersheypark Happy with a gift card for fun! The lucky recipients can redeem for season passes, admission tickets, or inside the Park to sweeten their day! Gift cards will be shipped in an enclosure card that lists the amount of the card as well as the name of the recipient and sender, if listed above. Gift cards are not returnable or redeemable for cash. Gift cards have no expiration date, and no dormacy or inactivity fees will be charged. Gift cards cannot be used for the purchase of Hersheypark tickets online. Hershey Entertainment & Resorts is not responsible for lost or stolen gift cards and will not refund a lost or stolen card. When a gift card is redeemed for purchase or service, the gift card must be used as the form of payment at the time of purchase - no exceptions.